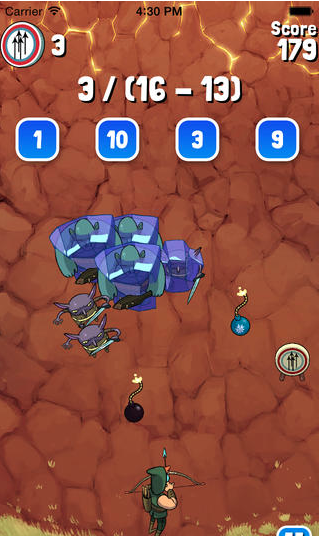 The Math Hunter is a new iOS game for helping students w/ their basic Math skills (i.e. addition, multiplication, subtraction, etc.) This is a super fun app that has players trying to solve Math equations so they have the ability to shoot monsters w/ their bow before they reach the player (or bottom of the screen). A nice feature is the ability to select which type of Math operation you want to work on (or can select multiple) as well as difficulty level. Another nice bonus is the ability to defeat the monsters a few ways such as: upgrading your bow, bombs, freezing them, etc. I highly recommend checking out The Math Hunter by clicking here!! !